Does eating raw vegetables aggravate IBS? It's a common question and there really is no evidence that says definitively either way. What is known is that many people dealing with irritable bowel syndrome (IBS) seem to think they do. Before you eat that next salad, let's examine how and why vegetables may provoke your IBS symptoms. 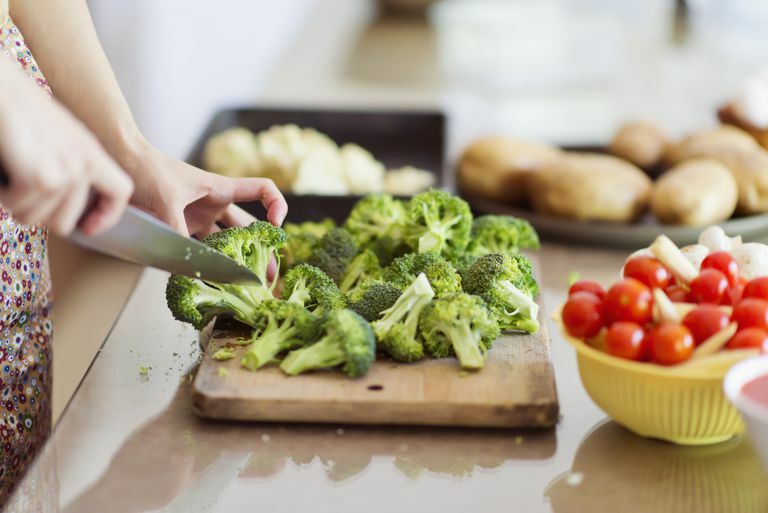 Why Might Vegetables Irritate IBS? To date, there is no clinical evidence that raw vegetables do or do not worsen IBS symptoms. However, there may be something to it because so many people with IBS complain about bloating, gas, constipation, and even diarrhea after eating raw veggies. Certainly, uncooked vegetables require more work on the part of the digestive system. It has to break down food components and deal with the fiber content of the produce. The heat from cooking starts this process, so raw foods take more effort to digest. It is possible that when you are eating salads or raw vegetables, you are simply eating a larger volume of produce. This may increase the gas and osmotic "load," in regards to the FODMAPs diet theory. It is also possible that it isn't the "raw" that is the problem, but rather which vegetables you are choosing. Many vegetables like mushrooms, celery, cauliflower, onions, and snow peas fall on the "high FODMAP food list" and may naturally trigger IBS symptoms. In no way does this mean that you shouldn't try to include vegetables in your diet. Everybody is different and IBS is different in every person. Proponents of raw diets discuss the benefits of eating raw foods to take advantage of the full array of enzymes available. It can also reduce immune system reactivity during digestion, which should be good for IBS relief. A more logical approach may be for you to become your own scientist by asking a few questions. Do raw vegetables cause a problem for you? Is it just certain vegetables? It will take some time to narrow it down, but by experimenting with various vegetables, you should arrive at some answers. By paying attention to how your body reacts with certain vegetables, you can begin to determine what you should avoid. You may find it helpful to use the FODMAPs food list as a starting guide. If you would like to reap the benefits of raw vegetables but are wary about the effects on your body, consider juicing. It is only an educated guess, but juicing may provide a more comfortable way to access the nutritional benefits of raw vegetables. Of course, there is always the option of cooking your veggies. Either of these options will begin to break down the food and make it easier on your digestive system to finish the process. Raw or not, vegetables are great for your digestive and overall health. Your "good guy" gut bacteria love veggies. Therefore, it is worth trying out a wide variety of vegetables to see which ones your belly can tolerate and which ones make your IBS worse. Is a Malabsorption Problem Behind Your IBS? Is Sourdough a Safe Bread to Eat If You Have IBS? Can Essential Oils Ease Your IBS Symptoms? Can Your Irritable Bowel Syndrome Really Be a Food Allergy? Is Candida Behind Your IBS? Is Your Vitamin D Deficiency Causing Your IBS? Should People With IBS Be Eating Wheat at All? Can Mindfulness Meditation Ease Your IBS Symptoms?